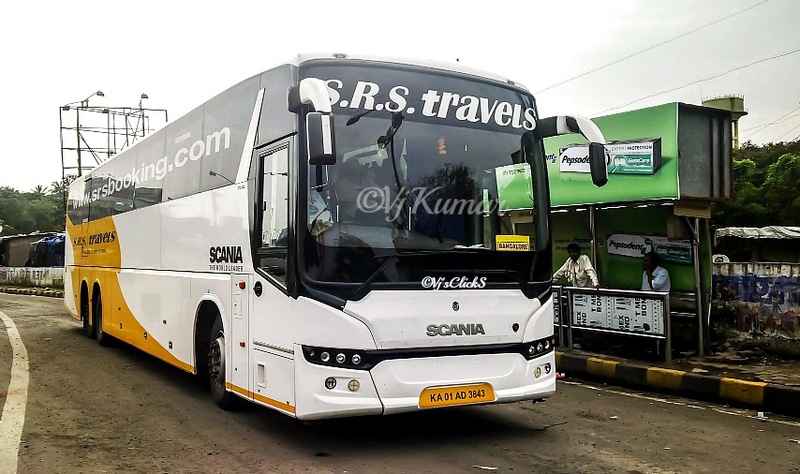 It was almost two months since SRS launched Scania buses on the busy Mumbai-Bangalore sector. Having tried this service once, I was eagerly waiting for an opportunity to try this service again. It was around 2pm on a sleepy Saturday afternoon when I started to sketch plans for my return journey. Airavat Club Class was on the menu considering the fact that one of my very best friend was on duty that day. I called him up immediately to confirm if he was available only to know he was not coming to Mumbai that day. Without further delay I launched the SRS website and found tickets available at the last 2 rows. I booked my tickets immediately and the wait for the journey began. Mumbai city was gleaming with colorful celebration of Gokulashtami, celebrating the birth of Lord Krishna. Dahi Handi was being celebrated with enormous zeal and enthusiasm at every look and corner of the city and the very sight of the same was fascinating. With the clock ticking, my friend decided to drop me at Borivali way ahead of my boarding time to avoid last minute rush considering the traffic snarls across the city. 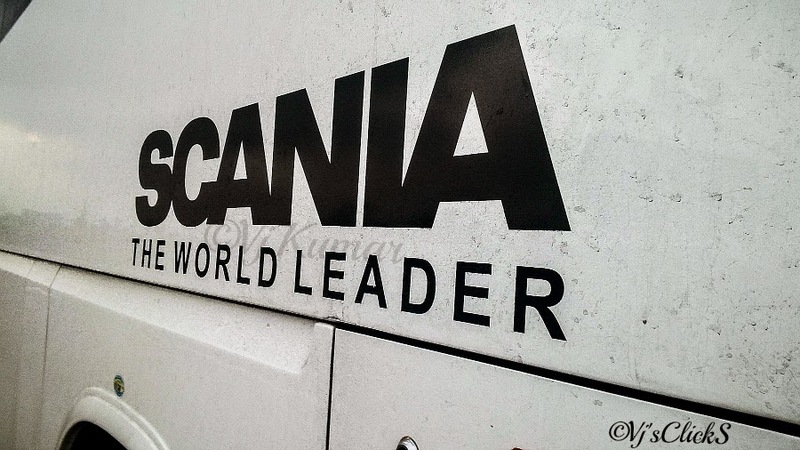 After enjoying a lovely meal, I decided to call one of the Scania crew to check if he was on duty that day. The answer was positive and he replied he had just departed from Mira Road. While the wait continued, scores of B9R from Neeta, Purple, VRL were picking up passengers to their respective destinations. Exactly at 14:48hrs, she showed up and the wait was finally over. The bus waited for few minutes and began to move immediately, I boarded the bus at the last minute and the crew welcomed me in. I headed straight to my seat and dropped my luggage and made my way to the front. Though being a Monday, the bus was running full with most of the passengers boarding from Andheri, Chembur and Vashi. Around 15 seats were booked from Pune. However getting to the pickup points was getting increasingly difficult as the traffic was piled up for miles. After picking up passengers at Malad, we headed towards Andheri . The pickup man was calling up passengers and was keeping them informed about the delay however few anxious passengers were calling at regular intervals to know the location of the bus. We crossed Chembur and finally headed out towards Navi Mumbai and the traffic slowly began to thin out. We reached Panvel in no time and with all passengers picked up, it was time to enjoy the journey. 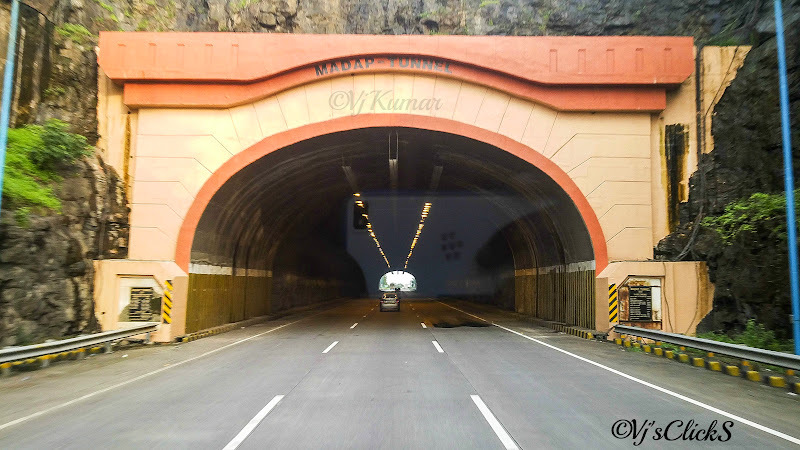 The view of the expressway was amazing and with the speeds now locked at 95kmph, the driving was were relaxed and sedate. The weather up ahead was not a worry as we cruised along towards Pune. I decided to stay back in the cabin shunning my comfortable seat. We reached Pune only to be welcomed by traffic which continued all the way till Katraj. After picking up passengers at Katraj, we took a U-turn and headed back to the highway as the road up ahead was jammed due to festival celebrations. We finally decided to make a dash for our dinner break as our stomach was now growling. We reach Amruth Garden in no time and pulled over for the last break for the night. After enjoying a very heavy dinner, thanks to the crew it was time to resume to journey. The crew change happened here and I again decided to stay back at the front as I had decided to make the best out of the journey. We resumed our journey and decided to make up for some lost time in traffic but the roads up ahead had other plans. Thanks to the callous attitude of the NHAI, the roads are riddled with potholes and endless diversions. It made me wonder why pay high tolls when the roads are so pathetic. As soon as we neared Satara, few spots of rain was noticed and as we neared Kolhapur the skies opened up. Rains began to lash. The bus handled the slippery conditions with ease as we crossed into Karnataka and pulled over at the RTO checkpoint. Though it was in the mid of the night and with rain, the RTO official took a detailed view of the luggage compartment to ensure no cargo was being carried. After ensuring the same, he checked the vehicle documents and we resumed our journey further. We pulled over at Nippani for a fuel/Bio break. The beast gulped in around 98ltrs of fuel and after a quick stop we resumed our journey. Finally as we crossed Belgaum, the rains stopped however we encountered Mist bringing down visibility. We slowed down to ensure we pass the stretch with no hassles and to witness this sitting up front was just amazing. Finally, my body started showing signs of fatigue and I decided to rest for the day. We reached Hubli bypass and the crew change happened here. I headed back to my seat to get a good night sleep. There was ample leg room with the seat infront of me fully reclined. The sound of the 13lr engine was musical as I closed my eyes. It was around 6:30am when the PA system came alive with the crew announcing breakfast stop. We pulled over at the regular Aroma restaurant near Sira as a couple of Paulo buses welcomed us in. With Bangalore another couple of hours, I decided to skip the breakfast only to be forced by crew. While at this juncture Sharma’s Luxura Sleeper and Paulo’s Man showed up. We resumed our journey and I decided to stay back at the front to enjoy the rest of the journey. As we neared Bangalore I felt a little saddened as I never wished the journey ended. However all good things must come to an end and so was this journey. We took the Yeswanthpur expressway as always and surprisingly Bangalore traffic was moderate and not the mad rush which I am used to. Time had come to say good bye to the crew with whom I spent unforgettable moments. The bus pulled over in Navrang at 9:15am ending my wonderful journey. 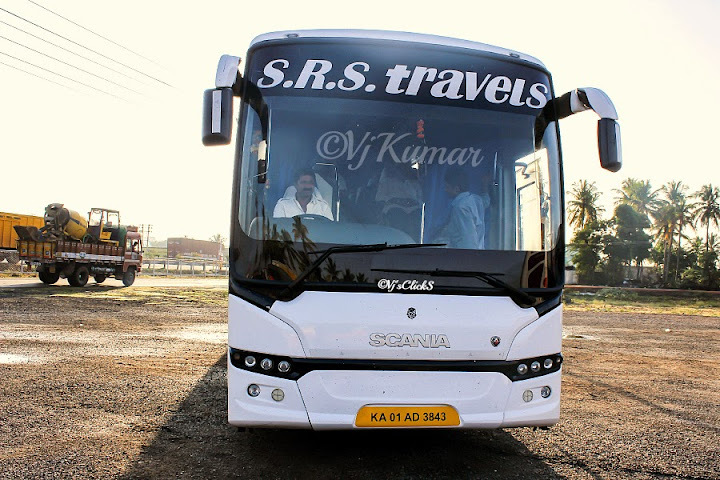 The service is really ideal for passengers who are regular on Bangalore-Mumbai route. The driving was very sedate and the crew was really helpful and ensured to keep the passengers comfortable throughout the journey. I on the other hand made the best out of my journey and will eagerly look forward for another journey.